If you have any questions about the GOLDEN ODYSSEY information page below please contact us. 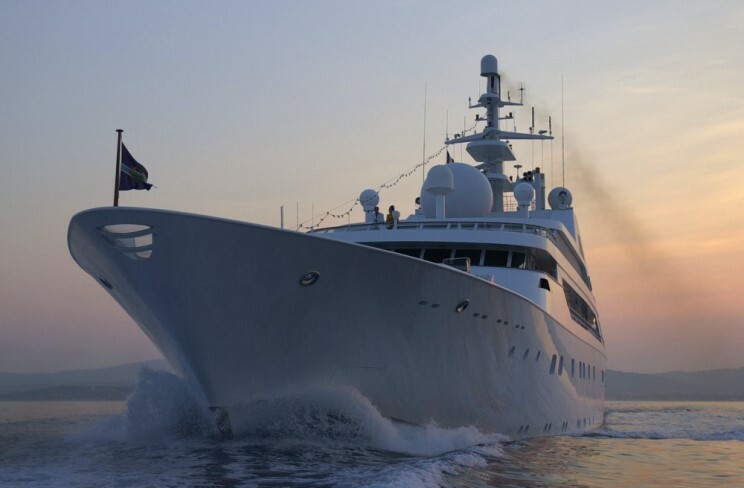 Ecologically concerned yacht owner, Prince Khalid bin Sultan, of Saudi Arabia, has for years been welcoming scientists aboard this yacht for research trips to study environmental impact. Yacht Golden Odyssey features a pool with a glass bottom positioned directly above a coral aquarium on the main deck. She is typically a part of a three vessel fleet, which includes Golden Shadow, and a sport fisherman, Golden Eye seaplane, used for provisioning, as well as a myriad of tenders and watersports equipment for guests to enjoy - which are all available for charter as the Golden Fleet - to a select group of guests, sometimes separately. 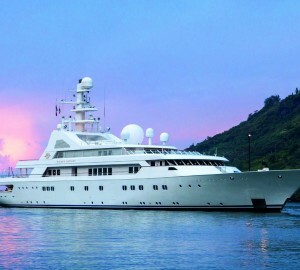 Blohm + Voss was the naval architect involved in the technical nautical design work for GOLDEN ODYSSEY. Also the company Blohm + Voss and JF Platou and Amble Associates successfully collaborated on this project. Interior designer Alberto Pinto was charged with the creative internal ambience. In 1990 she was actually launched to accolade in Hamburg and post sea trials and finishing touches was thereafter handed over to the new owner. Blohm + Voss Shipyards & Services completed their new build motor yacht in Germany. Her core hull was crafted from steel. The motor yacht main superstructure is made mostly using aluminium. With a width of 12.8 metres or 42 feet GOLDEN ODYSSEY has impressive interior. A deep draught of 4.05m (13.3ft) determines the amount of overall marinas she can berth in, depending on their particular depth. The SBV 12M 628 engine powering the yacht is produced by DEUTZ-MWM. Her propulsion units are twin screw propellers. The engine of the ship gives 2868 horse power (or 2140 kilowatts). She is fitted with 2 engines. The sum output for the yacht is accordingly 5736 HP / 4280 KW. With respect to stabalisers she utilises Blohm + Voss. Offering room for a maximum of 12 welcome guests staying on board, the GOLDEN ODYSSEY accommodates them comfortably. This ship utilises circa 25 expert crewmembers to maintain and sail. 80.15 metres / 262.96 feet. Giving the combined power of 5736 HP /4280 KW. Her top Speed is around 18 knots. Range in nautical Miles is 9100 at a speed of 16 knots. Roghudi. Italy. Provincia di Reggio di Calabria. Calabria. In October 2009 GOLDEN ODYSSEY cruised Roghudi, in Italy. GOLDEN ODYSSEY also cruised the cruising ground including Provincia di Reggio di Calabria during Sept 2009. Sabroe is the company that made the air conditioning on the yacht. GOLDEN ODYSSEY features a teak deck. The luxury yacht GOLDEN ODYSSEY displayed on this page is merely informational and she is not necessarily available for yacht charter or for sale, nor is she represented or marketed in anyway by CharterWorld. This web page and the superyacht information contained herein is not contractual. All yacht specifications and informations are displayed in good faith but CharterWorld does not warrant or assume any legal liability or responsibility for the current accuracy, completeness, validity, or usefulness of any superyacht information and/or images displayed. All boat information is subject to change without prior notice and may not be current.